Stock losses can lower your income taxes. You report stock losses on your income taxes in the year that you actually sell the stock. For example, if the price of a stock you own tanks, but you hold it in hopes that it will rebound, you can't claim the loss on your taxes. However, once you sell the stock, you can use the loss to offset other stock gains and potentially even claim a deduction. Filing your taxes with a stock loss takes a few more forms than a tax return without capital gains or losses. But the losses can help offset your other income, thereby lowering your income taxes. Determine whether your stock loss is a short-term loss or a long-term loss. Short-term losses occur when you sell a stock you held for one year or less. Long-term losses occur when you sell a stock you held for more than one year. Report the loss on Form 8949. Short-term losses are reported in Part I and long-term losses are reported in Part II. Either way, you must report the name of the stock, the date you acquired it, the date you sold it, the amount you received when you sold the stock, and the amount you paid for the stock, also known as your basis. Check box A if you received a Form 1099-B that included your basis in the stock to document the transaction. 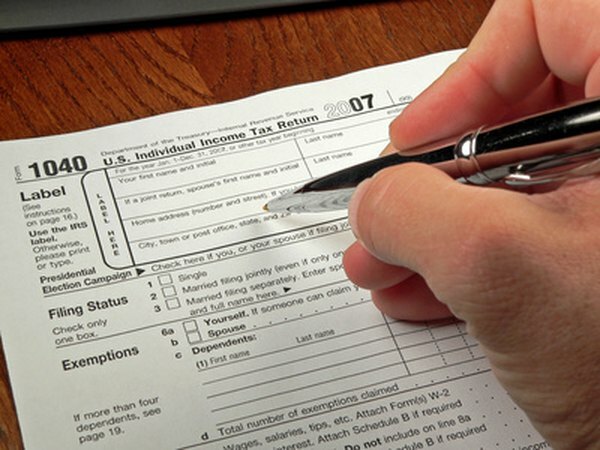 If your Form 1099-B did not include the basis, check box B. If neither A nor B applies, check box C.
Combine your stock loss with any other trades for which you checked the same box. For example, if you had a $5,000 loss for which you checked box A and a $1,000 gain for which you checked box A, you have a net $4,000 loss. Enter the gain or loss onto Schedule D on the appropriate line based on whether it is short-term or long-term and which box you checked. Short-term gains or losses are reported in Part I and long-term gains or losses are reported in Part II. Calculate your net gain or loss with Part III of Schedule D. Assuming you have a net loss, copy the smaller of $3,000 ($1,500 if married filing separately) or your loss to line 13 of Form 1040. If your loss exceeds the deduction limit, you can carry forward the excess and deduct it in future years.